The twice a year West Chester Gallery Walk is this Friday in downtown West Chester from 4-8pm. If you have never walked the Gallery Walk – this Friday is a great day to do it! First Fridays art shows are always fun and interesting in West Chester and Kennett Square, but “Gallery Walk” is only twice a year so bring a date and download a map from the Chamber of Commerce and check out the wonderful pop up shows all around West Chester this Friday! (http://greaterwestchester.com/wp-content/uploads/2014/09/Gallery-Walk-Booklet-October-2014.pdf) Most every store and bank has a wonderful local artist showing their work, and there are opening receptions as well at The Art Trust in the Meridian Bank “Listen” and Monique Kendikian Sarkessian’s opening at Z Gallery. “Listen” evokes a relationship between art and sound as is interpreted by artists Dane Tilghman and Christopher Vecchio. I have no idea what this exhibit will actually be, but it sounds cool and The Art Trust always puts on a great show and has delicious food and drink for their openings! 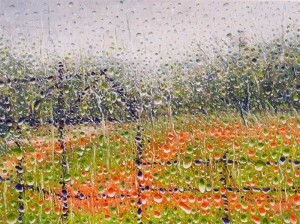 Everyone loves Monique’s sensual encaustics and oils, so visiting Z Gallery should be a treat. I’m showing a forest of tree paintings and sculptures at the Wells Fargo Building –a beautiful architectural setting that will make any artist look like a master, so hopefully my work will do that building justice. Denise Vitollo’s pastel works are exhibited at West Chester Starbucks, and Michael Stancato’s imaginative paintings are showing at Saint Agnes at 2333 West Gay Street. At Galer Estate Winery this Thursday Randall Graham will be showing his accomplished oil paintings for a pop up show from 4-8pm. Randall was raised in Malvern and studied painting with Neilson Carlin in Kennett Square and Bo Bartlett in Philadelphia. “Rain Delay” by Randall Graham. 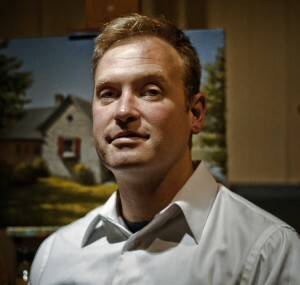 He just recently finished a commission mural piece for the town of Malvern which you can check out at https://www.facebook.com/MalvernMuralProject, but he devotes most of his time to oil paintings that seek out “the feeling that connects us all in a scene.” Some of his plein air work has some intriguing light effects that recall Edward Hopper, and he has some unusual new images that show the effects of raindrops on surfaces that almost go abstract. In Kennett Square there is also First Friday Art Stroll, which includes an opening reception from 6-9pm for artist Judy Antonelli at the Longwood Art Gallery at 200 State Street. Also from 6-9pm is an opening reception for “Metamorphoses” at Mala Galleria on 206 State Street, featuring the fascinating works of Jusoslav and Violeta Ocokoljic. These Serbian artists present some intriguing paintings that balance the line between icon and epic storytelling. Looks like a wonderful show! In Oxford at the Oxford Art Alliance, there is an opening reception from 5-8pm this Friday for their show “inspired Landscapes” which includes a number of local artists who specialize in gorgeous landscapes. The exhibition cover is the image “Ancestors Rest” by John Davis Wissler. It is just stunning, and makes me want to see the works of the other artists that are exhibiting in this show. Farther afield, Franklin Commons Gallery in Phoenixville is opening their Photography show. This is really such a marvelous site for showing artworks. Curated by Katie Naber, this two story high gallery is a fantastic artspace for artist and art lover alike. For local Chester County folks, Phoenixville might be a bit of a hike, so you might combine your trip to the Franklin Gallery with a trip to the fabulous open air farmer’s market and a visit to the Diving Cat Studio and coffee at the Artisan’s Gallery and Café Spot or Soltane for yummy bread, coffee and art. At Bayard Taylor Memorial Library in Kennett Square there will be two art history lectures this month. Art historian Fred Dixon will be speaking about “Impressionism” Thursday October 9th at 6:30. He will be signing copies of his book “700 Years of Art History” at the end of the lecture. Noted writer and historian Gene Pisasale will be talking about the art of the Brandywine Valley. From the American Revolution to the Wyeths. Please come and encourage the Library to have more discussions and lectures on the arts. Lele Galer is an artist who has chaired numerous art shows, taught art history and studio art, public art and has chaired, written and taught the Art in Action Art Appreciation series for the UCFD schools for the past 12 years. She worked at the Metropolitan Museum of Art, and wrote for the Asociated Press in Rome. She has been dedicated to Art History and art education for most of her adult life. Lele and her husband Brad own Galer Estate Winery in Kennett Square.